Attached are the logo files as well as the use guidelines. 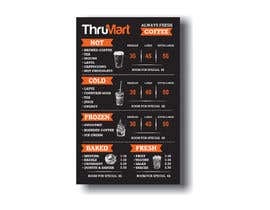 Utilizing these files and your creativity provide a menu design board for a drive thru convenience store. These stores sell fountain sodas and coffee and candy and just about everything you would find at a traditional convenience store but in an express drive thru. If you need further examples, I would describe like a 7-11 but only drive thru. We want to highlight a few areas for quick reference, provide a rough idea of what is available, list the main product movers like coffee and grab-n-go foods which are prepared food items such as sandwiches as well as other ready to eat food items. We also want to provide sizes like small, regular, large and extra large. These major areas are included in the files are as well. All entries not meeting all of the minimum requirements will be rejected so please pay careful attention and if you have questions direct them to the community board. Messages requesting to review a particular entry will be deleted. Finished electronic files will require ready to print documents as well as pre-press ready in multiple formats. We look forward to your entries and Good Luck! We are debating listing price. There are nice entries with price and without. Most people do not care about price when they order, only after or to make a decision on more or less. If you were driving or walking up to a store when you have only seconds to order and make decisions you want to see something that is easy to read a summary and slight detailing underneath. Imagine driving and put your design submission to your own test and you might be hard of seeing or hard to see all colors so keep in mind. Hi there, I will submit tomorrow. We are debating to show price. We have seen versions with price for all products and price for some products. There are pros and cons to both approaches and will likely desire with price and without. Food type graphics are okay, not necessarily needed but nothing to realistic and only as a design element. So you need a version without price too? Hi - DO you want this purely text based, or will you be adding pictures (like of the coffee/food etc)? Feel free to use complimenting colors but our main colors are what is provided in the use file. do you want to show the price too? 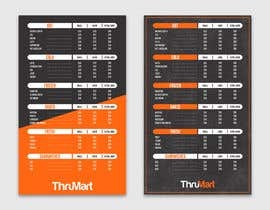 In our whole design of the menu, would you like us to only use the 2 colors provided or are we allowed to include other colors?